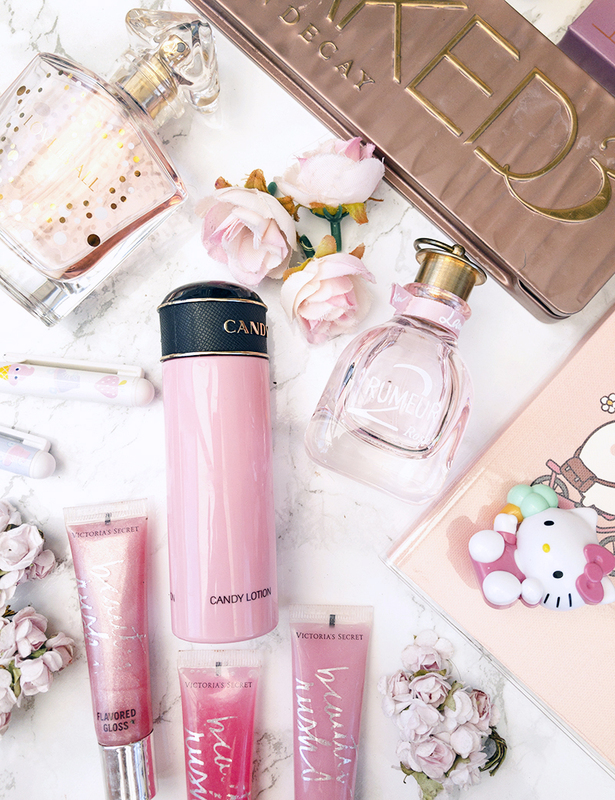 The ultimate Christmas perfume gift guide for every taste! Hello, my loves! It truly feels like the Christmas season starts earlier every year, doesn't it? We're still in November and so many of us are already putting up Christmas decorations, trees; even advent calendars have been on sale since September! Some of you may already be thinking about gift ideas, and perfumes are always a popular choice for Christmas. 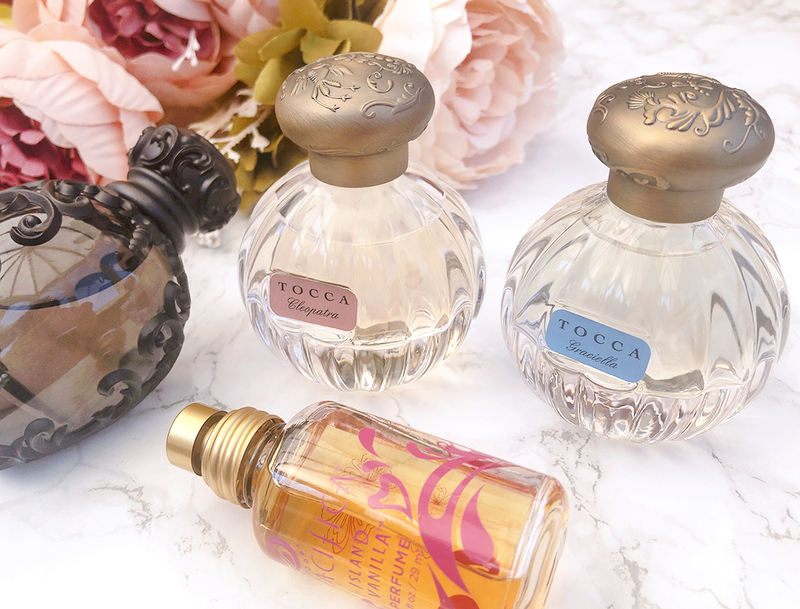 Fragrances make wonderful gifts, although it can be difficult to pick the right one, especially considering how many options there are to choose from! 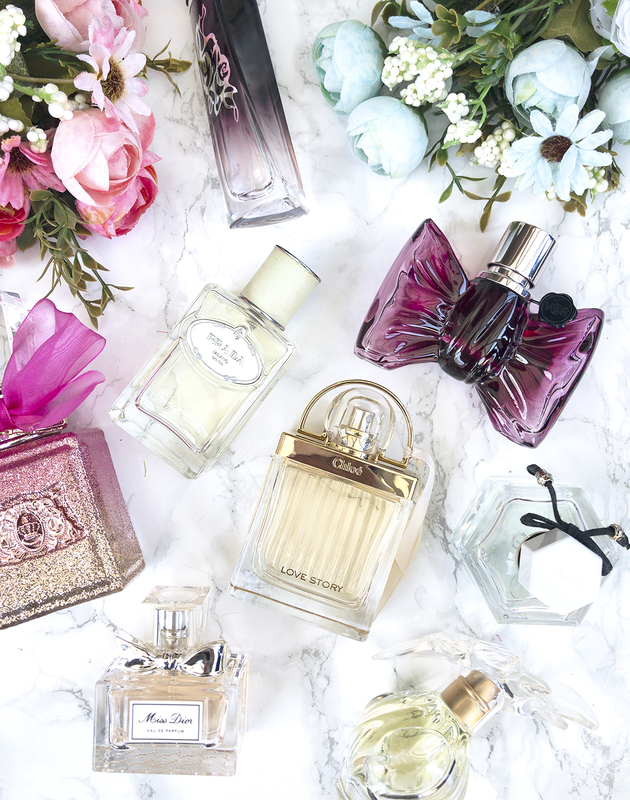 Today, I thought I'd put together a little guide that will hopefully help you to pick the perfect fragrance. Hope you enjoy! Hello, my jelly beans! 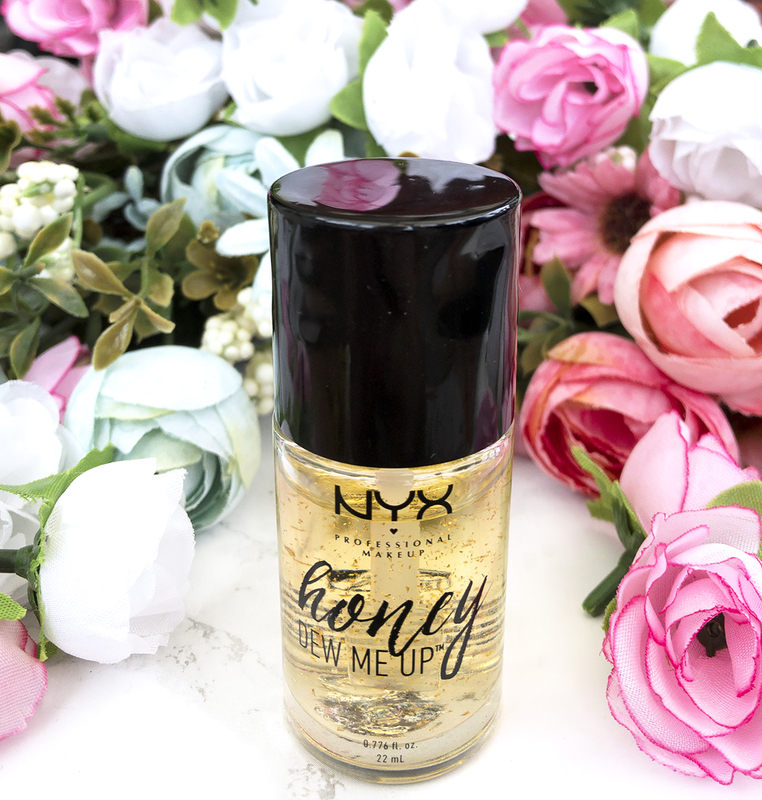 Today, I am so happy to be bringing you a review of the NYX Honey Dew Me Up primer (£15, Boots). 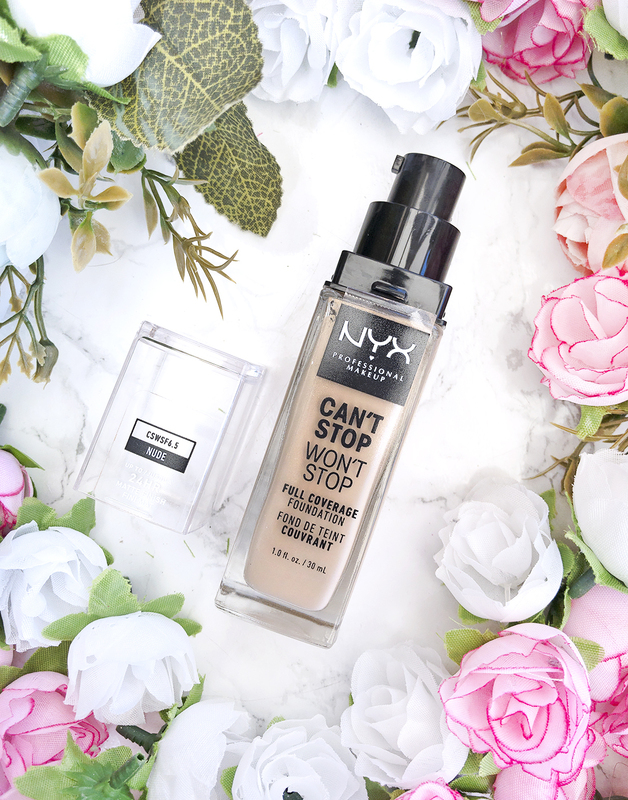 I don't typically review primers on my blog, but this one has been getting quite a lot of attention in the blogosphere lately, so I thought I'd share with you my honest thoughts on it. I was on the lookout for a new primer for a while, and Honey Dew Me Up caught my attention right away - the gold-speckled formula looks very unusual and interesting! However, is it actually a reliable primer? Let's find out together! Hello, my jelly beans! 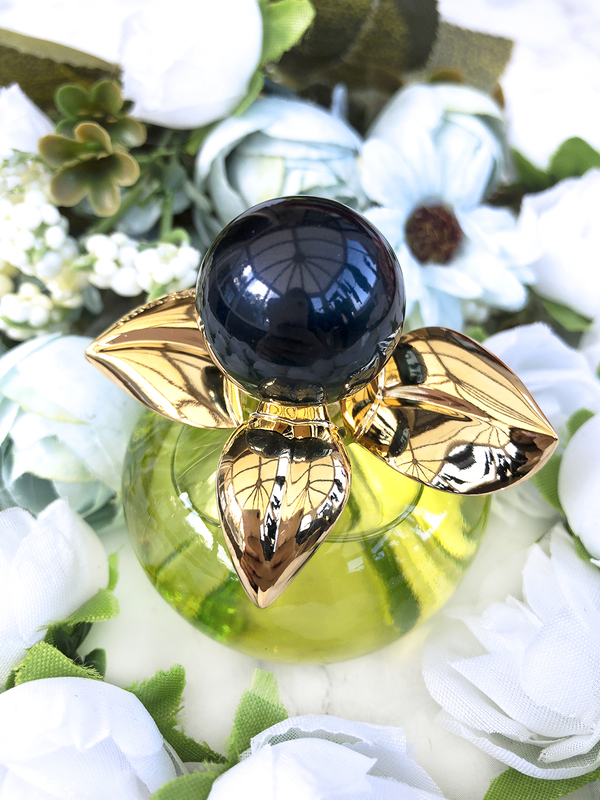 It's been such a long time since I did a seasonal perfume recommendations post for you. I actually took a pretty long break from talking about fragrances in general, and haven't bought a single new bottle this year! I've been trying to appreciate what I already have instead, so I've been looking forward to sharing these carefully selected picks with you, loves. Autumn is probably my favourite season (who doesn't love the cool, crispy, pumpkin-spiced goodness! 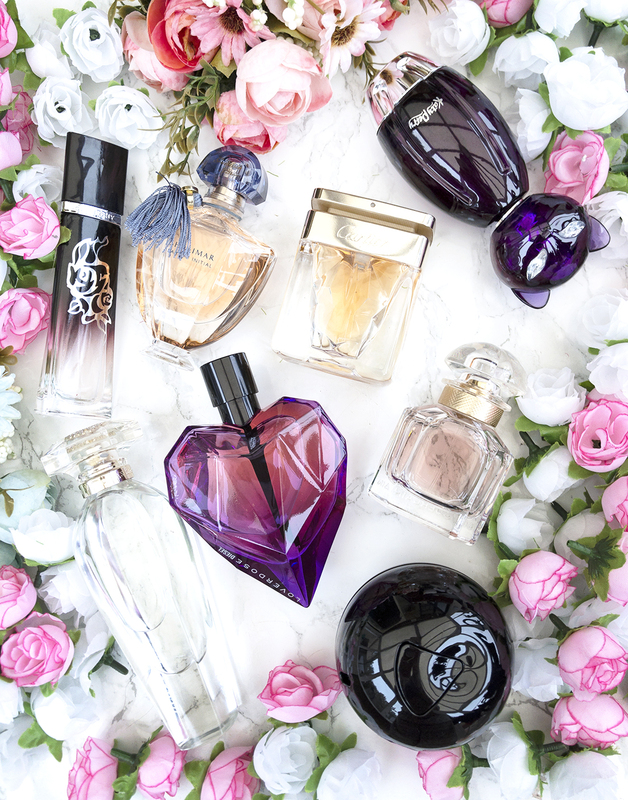 ), and it's also the perfect time to wear perfumes that are a little more bold, sweet and intense. My favourite autumn fragrance notes include earthy patchouli, balsamic amber and sweet caramel; all of which will feature in today's list. Hope you enjoy! Beauty discoveries with the KindLook box - September unboxing! Hello, my loves! Today, I have a very special unboxing for you. I've teamed up with the lovely folks over at KindLook, to bring you a full review of their September edition cruelty-free beauty box. KindLook is fairly new to the subscription box market, but they've already made an impact with fantastic value for money (spoiler alert - this box contains over £90 worth of products), and quality goodies (from brands like Illamasqua, Kat Von D, Spectrum and Urban Decay). It's honestly not easy to get me excited about subscription boxes anymore, but looking at the past KindLook boxes definitely got me very hopeful for the September edition. Could this be the best cruelty-free beauty box yet? Or will it disappoint, like so many others? Let's unbox it together! Hello, my loves! 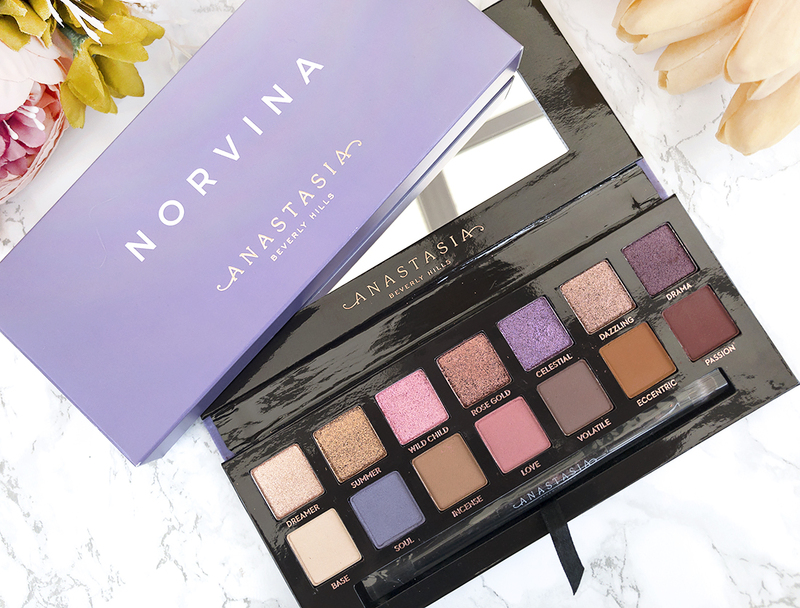 Today is a very special day - I am very excited to be bringing you a review of the Norvina eyeshadow palette by Anastasia Beverly Hills (£43). This palette has caused quite a stir in the beauty community (with some complaints of heavy fallout and powdery texture), so I cannot tell you how happy I am to finally try it out for myself. When I first saw the Norvina eyeshadow palette online, I was completely obsessed with the shade selection. Most of the palettes I own are very warm-toned, so I was excited to try something a little different and slightly out of my comfort zone. 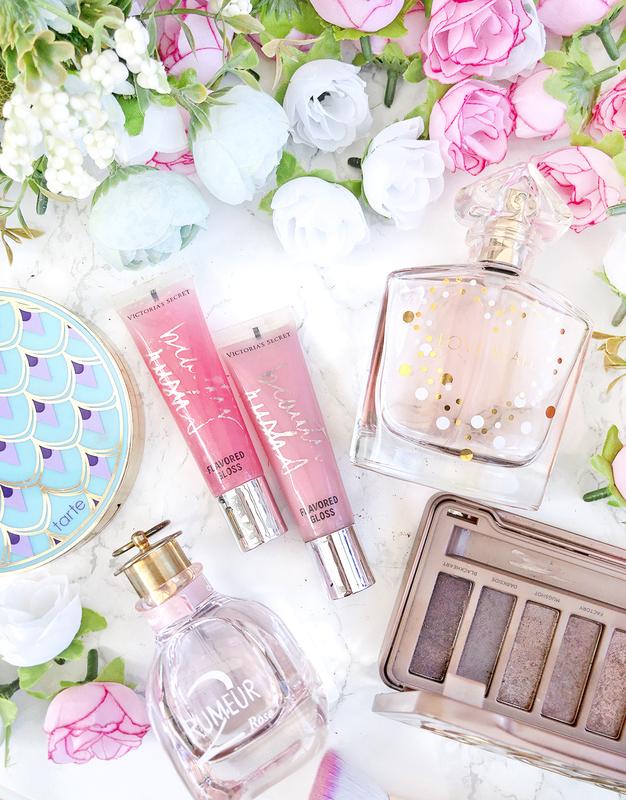 Today, I will be sharing with you my honest thoughts on this little palette. Is it worth the hype? Is the fallout really that bad? Let's find out together! Hello, my loves! Today, I am very excited to be bringing you another, very special vegan beauty unboxing with the Pip Box. 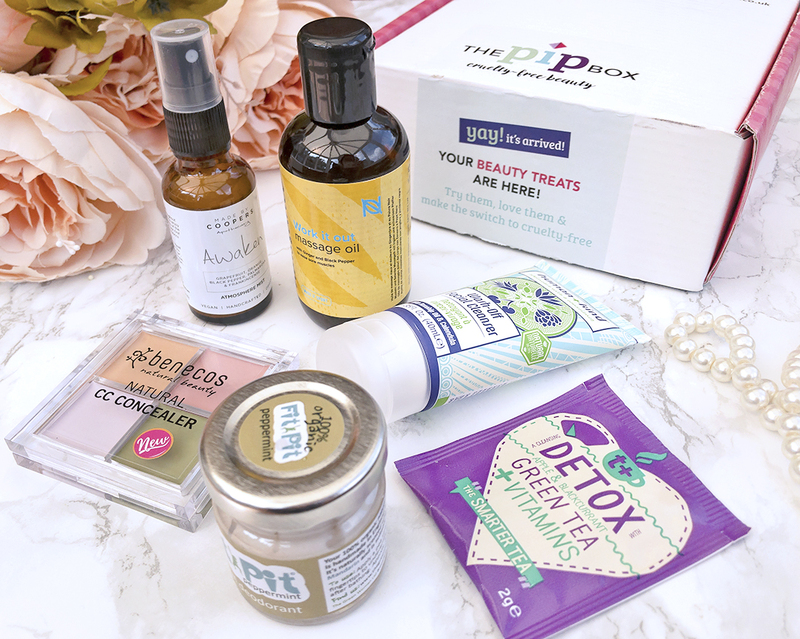 TheVeganKind box (which I reviewed for you last time) restored my faith in subscription boxes, so I was incredibly excited to team up with the Pip Box and review their August selection of all-natural, vegan and cruelty-free beauty products. This box costs £20 with free UK delivery (although the cost is less per box if you choose a long-term subscription), and it will arrive at your door every month. 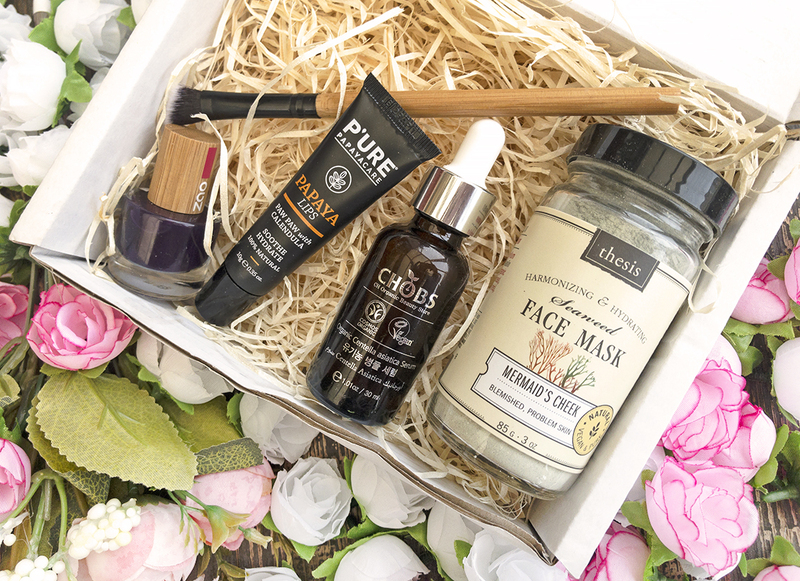 The August box is the 'Energise Edit', with a focus on health, fitness and well-being. It definitely sounds promising, and I hope you enjoy! Hello, my jelly beans! 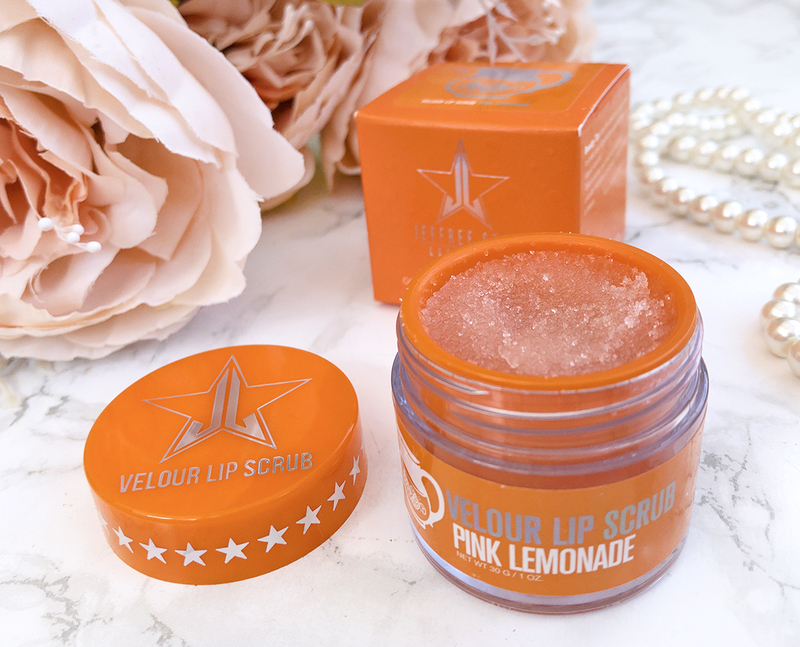 Today, I am very excited to bring you a review of the Jeffree Star Velour lip scrub in Pink Lemonade, which is part of the 2018 Summer Collection. 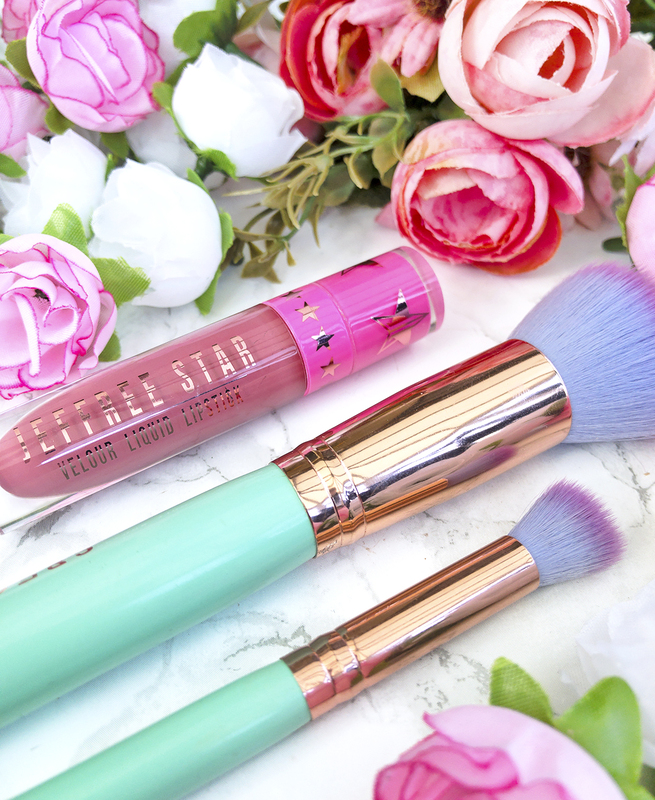 Whilst I know that people tend to have mixed opinions about Jeffree himself (although personally, I think the recent YouTube mini-series starring him and Shane was pretty amazing), I've always been a fan of his products as they're very reliable, unique and not overly pricey. This was actually my first time trying out a proper lip scrub of any kind - my lips are very sensitive, so I've always been a little cautious about exfoliating them! Today, I will be sharing with you my honest thoughts on this Velour lip scrub. Hope you enjoy! Hello, my loves! Today, I am very excited to talk to you about a fully vegan, fully cruelty-free beauty box by TheVeganKind. If you've been reading my blog for a while, you might know that I've always had a bit of a love/hate relationship with subscription boxes. 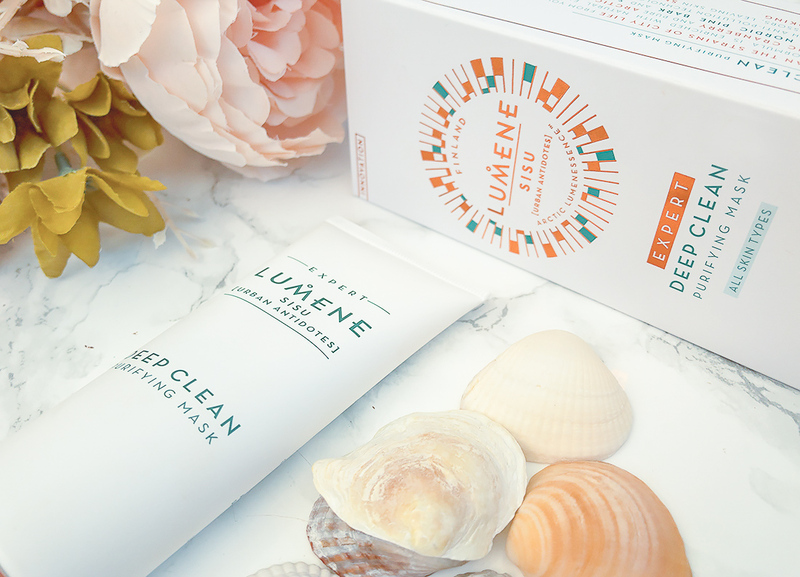 The element of surprise can be very exciting, but I've had mix luck with beauty boxes in the past where I just wouldn't use most of the products. Having said that, I cannot tell you how happy I was when I found out about TheVeganKind box. I've been trying to explore more cruelty-free products, but it can be difficult since a lot of brands aren't 100% clear on their animal testing policies. So, to have a lovely beauty box full of vegan, cruelty-free products is just so useful in terms of trying out new and different brands. 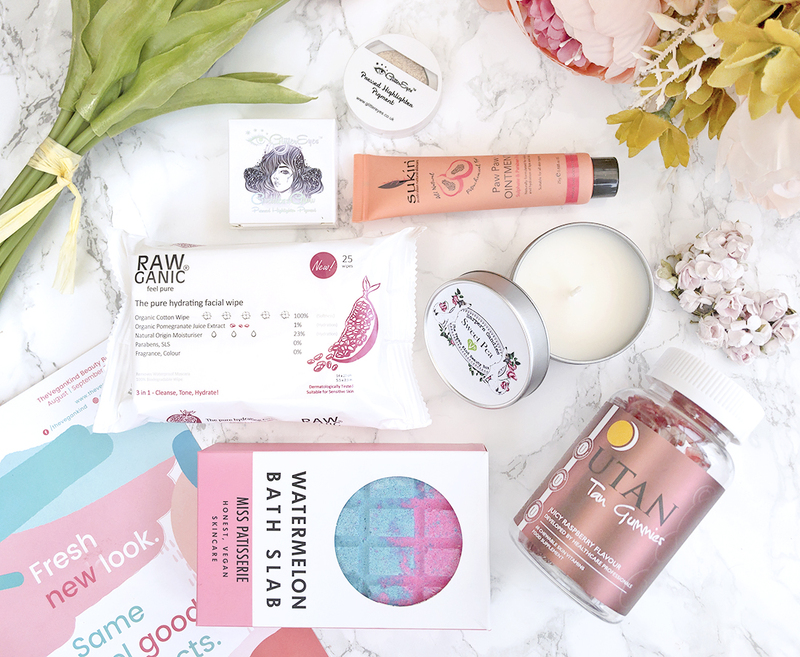 TheVeganKind beauty box costs £15 +£3.15 p&p per box (although the cost is less per box if you choose an annual subscription), and it'll arrive at your door once every two months. Today, I will be showing you the August 2018 edition. Hope you enjoy! Hello, loves! It's been a while since I've done a skincare haul, so I'm very excited to share my finds with you today. On my search for good, cruelty-free skincare (which can be harder than you'd expect! 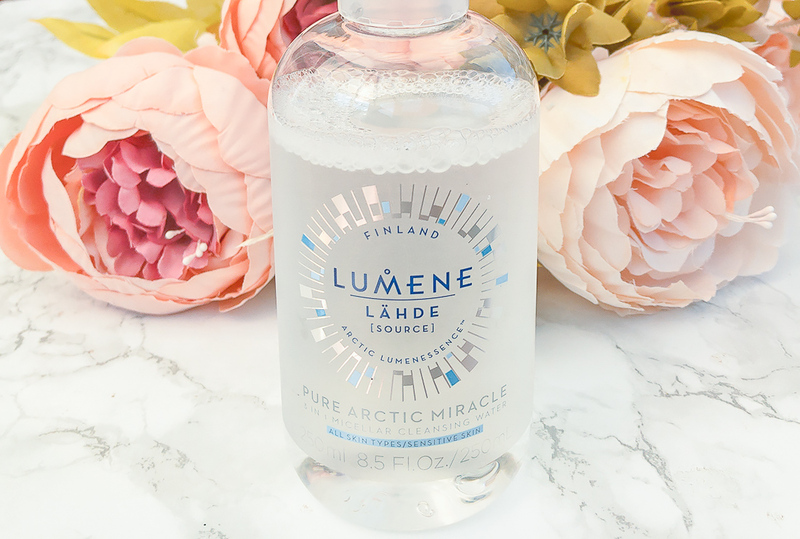 ), I've come across this brand from Finland, Lumene (not sponsored, although I wish!). They offer a wide range of cruelty-free skincare and makeup, including lots of vegan options, which is great! I went ahead and purchased a few products, and today, I'll be sharing with you my first impressions. Hope you enjoy! This fresh, lightweight cream is quickly absorbed into the skin, leaving it soft, smooth and intensely hydrated from the very first application. Contains pure Arctic spring water to promote a healthy-looking complexion. I actually tried a sample of this a while back, and enjoyed it so much that I just had to get the full size! 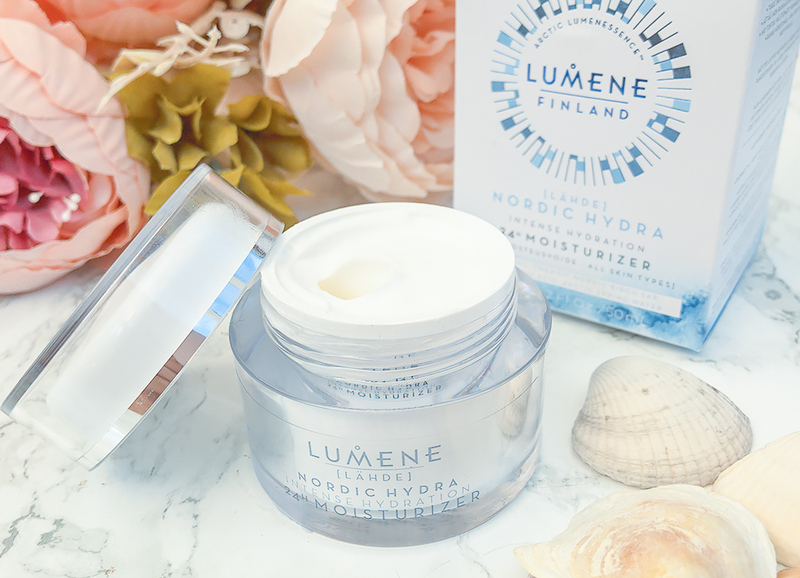 This is, hands down, the most refreshingly hydrating cream that I've ever used. It's easy to apply and leaves your skin feeling thoroughly moisturised, without any greasy residue. I've tried a lot of creams in the past that just wouldn't absorb very well, which would put me off moisturising in the mornings. This one, however, feels unbelievably lightweight and absorbs beautifully in just a few seconds. 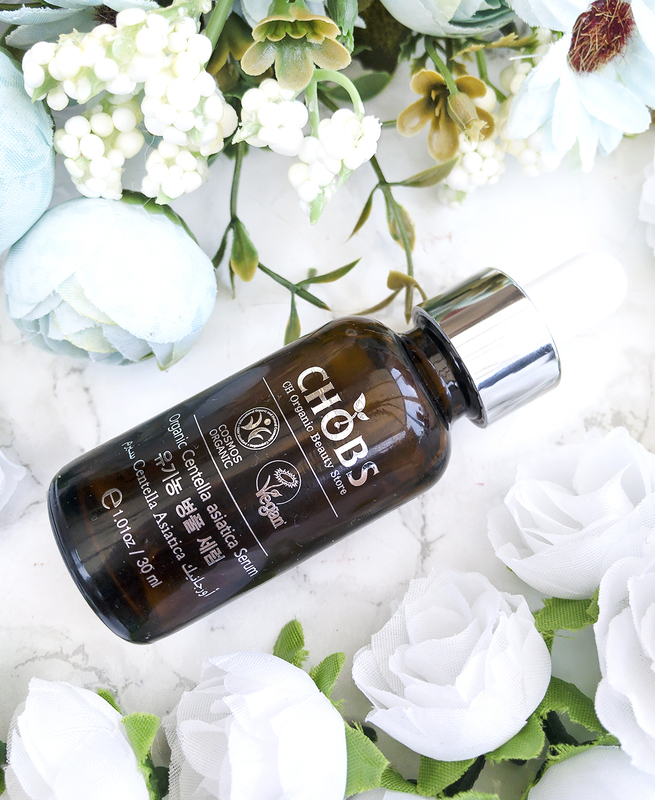 It genuinely makes a difference to how your skin looks and feels, and it might just become my all-time favourite, cruelty-free day moisturiser. The purity-boosting clay-based formula is enriched with natural exfoliating particles from Nordic cranberry and pure Arctic spring water. Combined with anti-pollution technology, it helps to protect against external stressors, leaving skin smooth, fresh and naturally radiant looking. Whoever designed this formula, was very serious about the 'deep clean' part! This mask leaves your skin feeling squeaky clean, smooth and soft. The texture is interesting as it feels more like a lotion (unlike clay or peel masks), that doesn't really harden when dried up. It exfoliates well without drying out your skin, although I'd say that it's probably more suitable for oily skin types. Also, despite how thoroughly cleansing it is, it actually feels very gentle on the skin! I'm always a little cautious about 'deep clean' face masks as they can be quite irritating, but this one feels incredibly gentle and almost soothing when applied. The gentle freshness of water is combined with the efficient cleansing properties of micellar particles. Skin is thoroughly cleansed, and appears freshly hydrated and radiant. I was looking for a good, vegan and cruelty-free alternative to my usual Garnier micellar water, and this one was actually amongst top-rated products on the feelunique website. The price is a little higher than what I'd expect to pay for a bottle of micellar water, but I thought it was worth a try, and I definitely wasn't disappointed! This micellar water gently melts away all your makeup without needing to rub, leaving your skin feeling fresh and clean. It's definitely as effective as the Garnier micellar water, although it does struggle a little more with waterproof mascara. The formula also feels more 'concentrated' - you need much less product per application to achieve the same results. 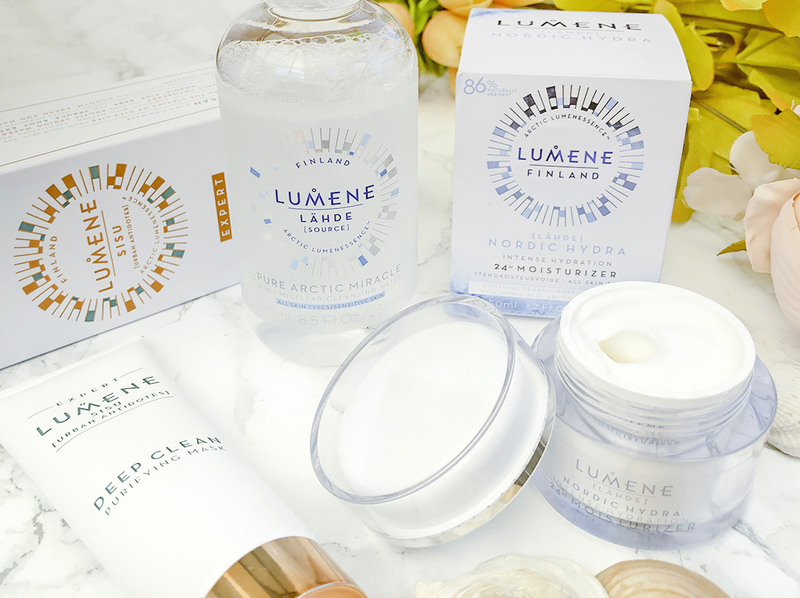 Have you tried Lumene skincare before? What skincare products have you been loving lately? Hello, my loves! 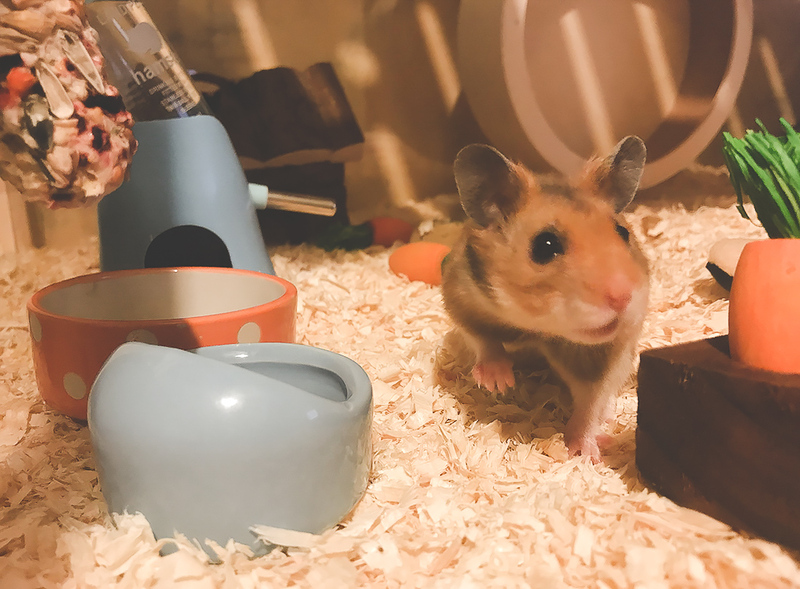 Today, I want to introduce you all to someone very, very special - my little Syrian hamster, named Cinnamon Roll. We got him just over a week ago (it was an early birthday present from my partner), and I love him so much that I just couldn't wait to share with you the happy news! Cinnamon Roll is currently about 10 weeks old, and it is the cutest, fluffiest bundle of joy that I've ever seen! 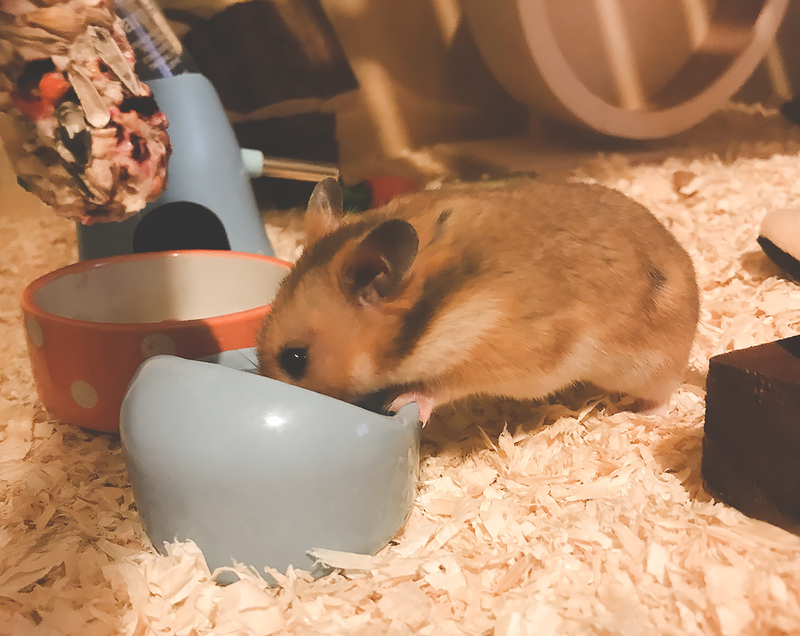 Me and my boyfriend always wanted to keep a pet, and a little Syrian hamster seemed like a perfect addition to our family. 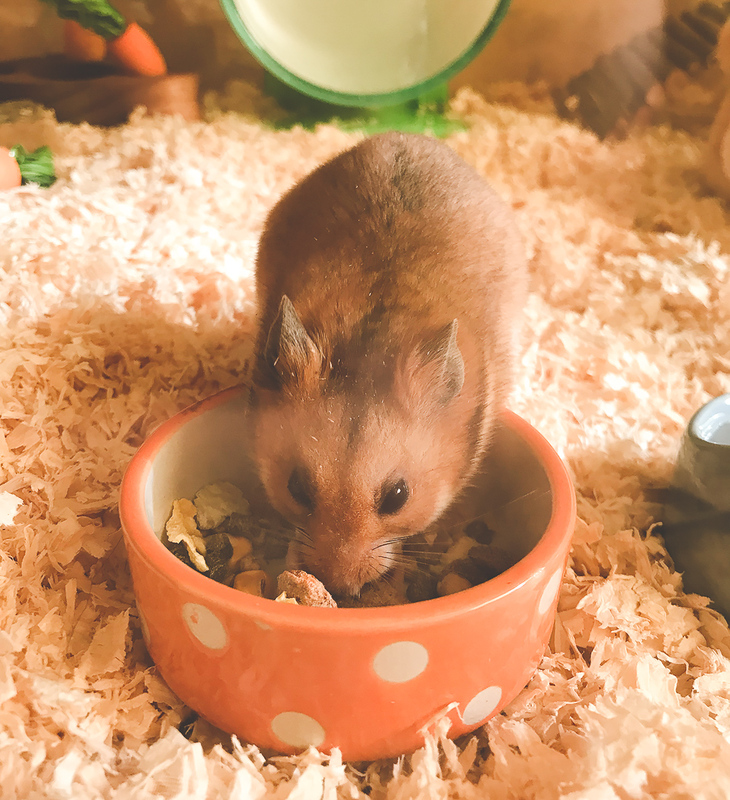 We wanted to give him the most amazing home possible, so we invested in a large Living World Green Eco Habitat tank, which is 95cm wide and 49cm high, giving him lots of room to run around and explore. We also bought him lots of toys, places to hide, an exercise wheel (which I recently upgraded as the initial one ended up being too small! ), food and treats. It's still work in progress, and I would like to eventually give the cage more of a theme (I'm thinking maybe a woodland or rainforest theme), but I think it's a good start. Let me know if you would like to see a more detailed hamster cage tour! The minute I laid my eyes on this little hamster, I knew he was the one I wanted to get! He was all curled up in the corner, shy and super adorable. We've been getting to know him over the past week, but it's still early days. For now, we're just giving him space and letting him adjust to the new environment (as much as I'd love to just go ahead and give him a proper cuddle!). So far, Cinnamon Roll seems to be adjusting very well to its new home. 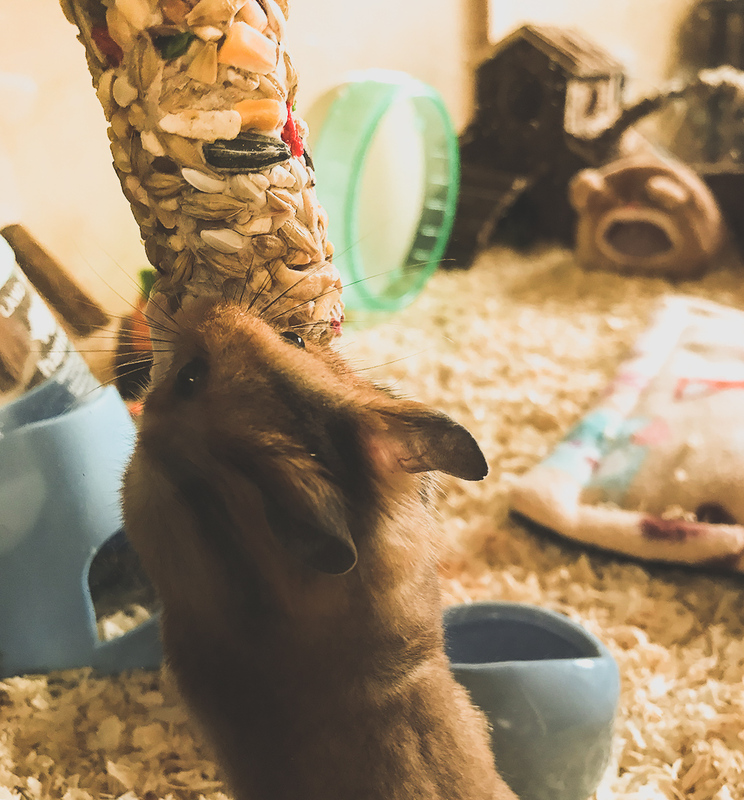 He's super curious and loves to explore his cage, which is so heart-warming to watch! He's still a little shy and quite easily startled, which of course is completely expected. 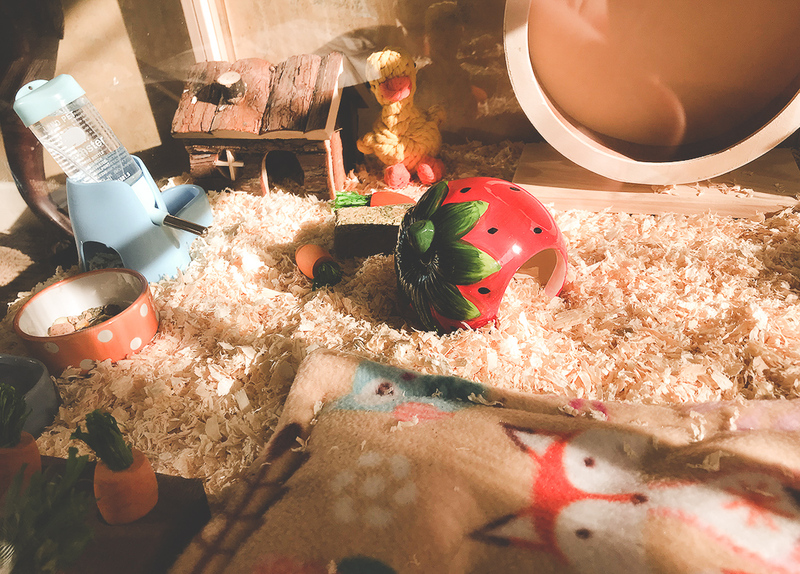 He's made a nest and moved his toys inside one of the wooden houses, which seem to be his favourite spot to hide and rest. 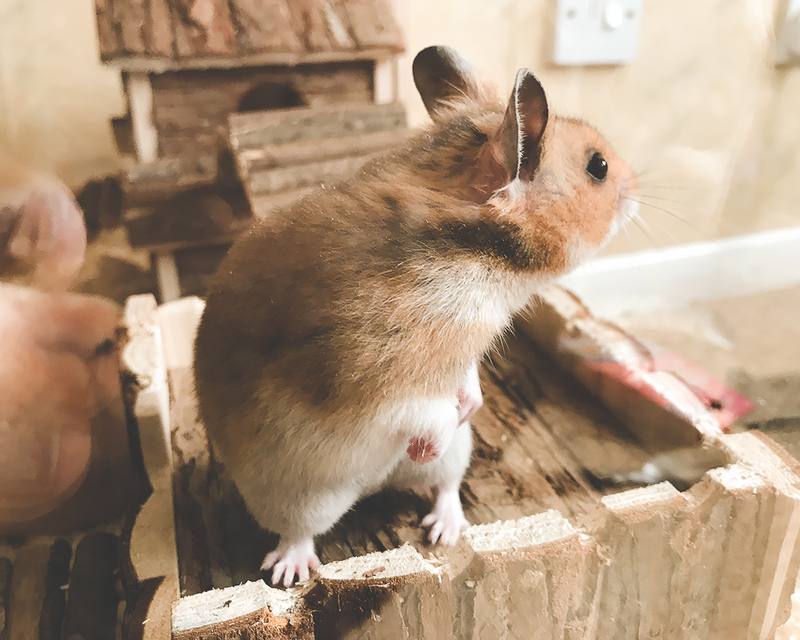 I've read up quite a lot on taming hamsters, and whilst they're naturally quite curious and friendly, we're being patient and taking things slow. I have yet to handle him properly, but it's okay as we just want him to fully adjust to his new home! 100 lifestyle blog post ideas! Hello, my loves! Today, I am excited to share with you 100 lifestyle blog post ideas, that will hopefully help you out if you ever happen to hit a creative block. I think that it's only natural to feel a lack of inspiration from time to time, especially if you've been blogging for a while. Whenever I feel creative, I like to write down any blog post ideas that come to mind in a little notebook, and use them later on. There is an endless amount of things that you can talk about as a lifestyle blogger, so I've compiled a list of some of my go-to ideas. This includes everything from travel, blogging to food and personal posts - I really hope that you find them useful! 4. Review your local restaurant, bakery, coffee shop, etc. 31. Who inspires you the most in your life? 45. What's in your travel suitcase? 55. 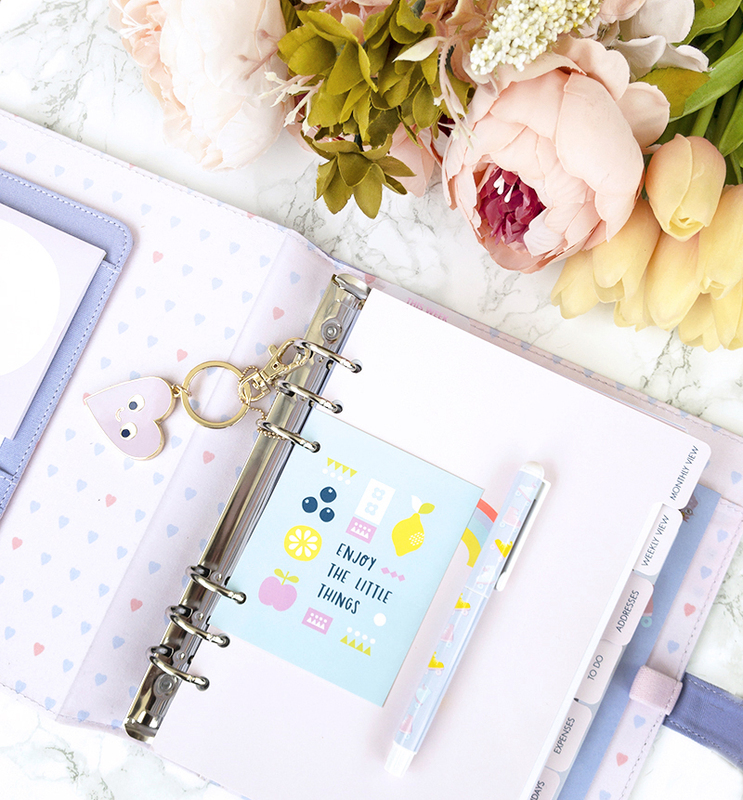 Your stationery collection - shows us what you have! 61. The worst film you've ever seen? 66. Share your guilty pleasures - songs, films, etc. 68. Your playlist for relaxing/date night/night out, etc. 81. Share your favourite blog resources - fonts, templates, etc. 85. Why did you start blogging? 93. Seasonal gift guides - Christmas, Valentine's Day, etc. 94. Budget celebration ideas - birthdays, anniversaries, etc. And that's about it! Hope you enjoyed these post ideas, and will find them useful. What are your main sources of blog post inspiration? 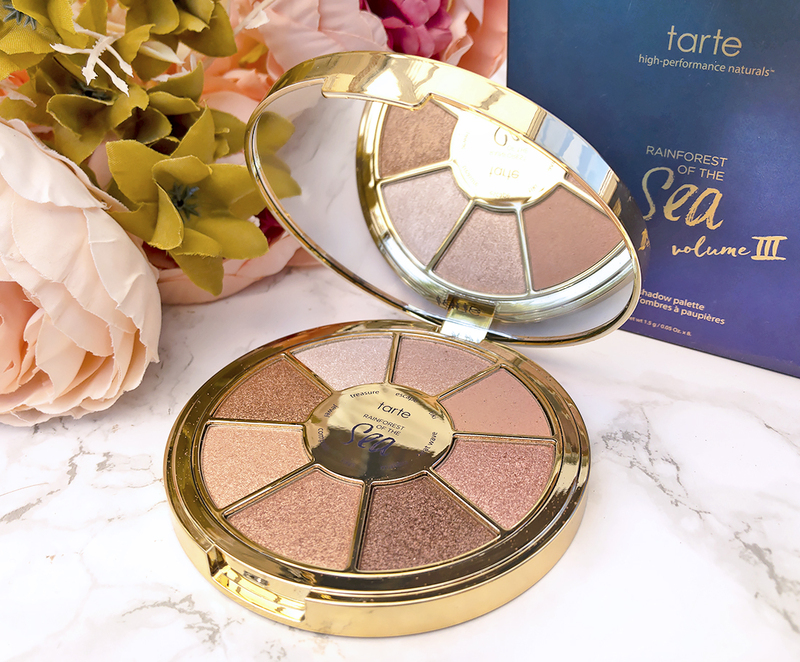 Tarte 'Rainforest of the Sea Vol. 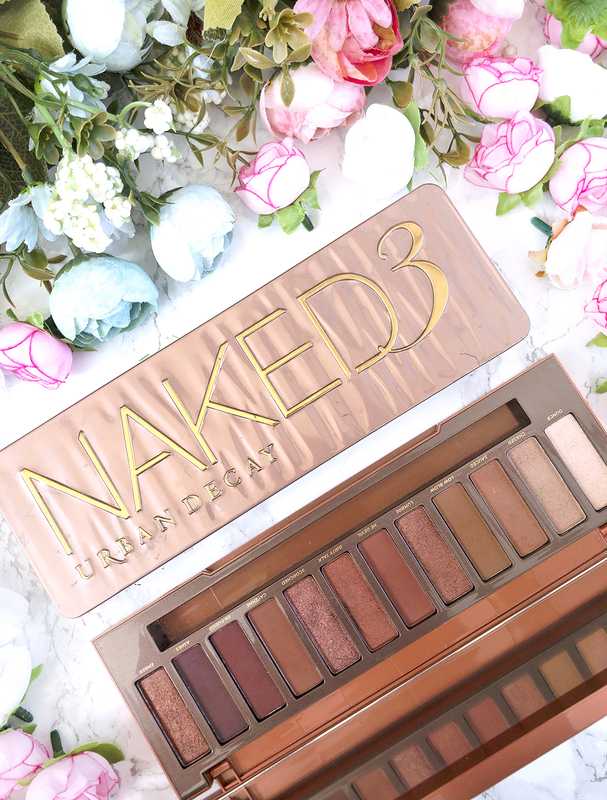 III' palette review + swatches! Hello, my loves! Today, I am very excited to talk to you about this gorgeous highlighting eyeshadow palette by Tarte, called 'Rainforest of the Sea Vol. III' (£30, Tarte). I stumbled across this one whilst browsing Tarte's vegan makeup section, and, as a huge fan of shimmery eyeshadows, I was immediately drawn to how pretty it looked. This was actually my first time any of Tarte's makeup, making this review a very special one! Today, I will be sharing with you my honest thoughts on this little palette. Hope you enjoy! Hello, loves! Today, I am very excited to share with you the first in a new series of 'what I eat in a day' posts. Personally, I am a huge fan of these types of posts and videos - as a helpless foodie, I am always interested in new recipes and ideas. 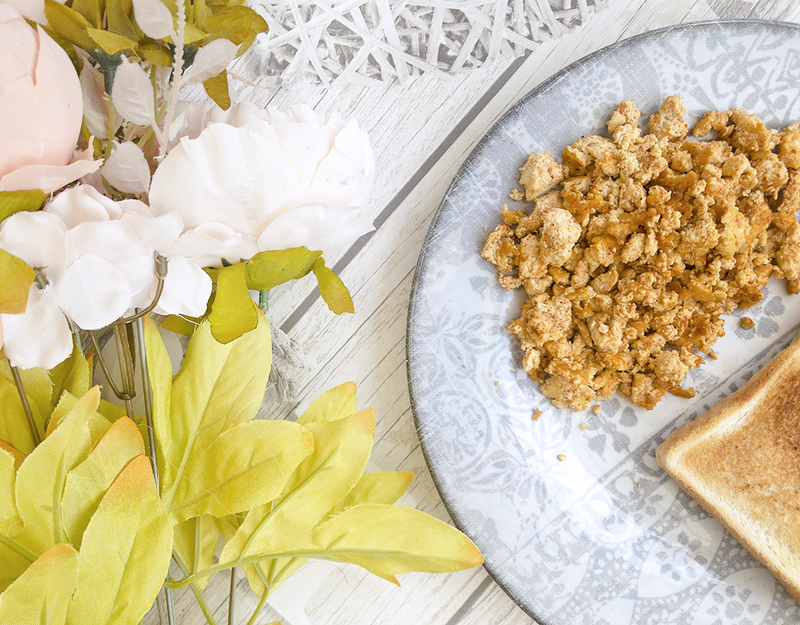 Today, I want to show you what I eat on a typical weekend day. This is by no means a dietary guide on how you should be eating - my food choices are not always the healthiest, and I like to keep any meal prep as minimal as possible (I'm pretty lazy, and helpless in the kitchen!). A lot of people seem to think that eating vegan involves a lot of cooking and prep; so today, I want to show you just how easy it can be. Hope you enjoy! As it was a Sunday after a pretty rough week, I decided to treat myself to my favourite breakfast ever - a cheese toastie! 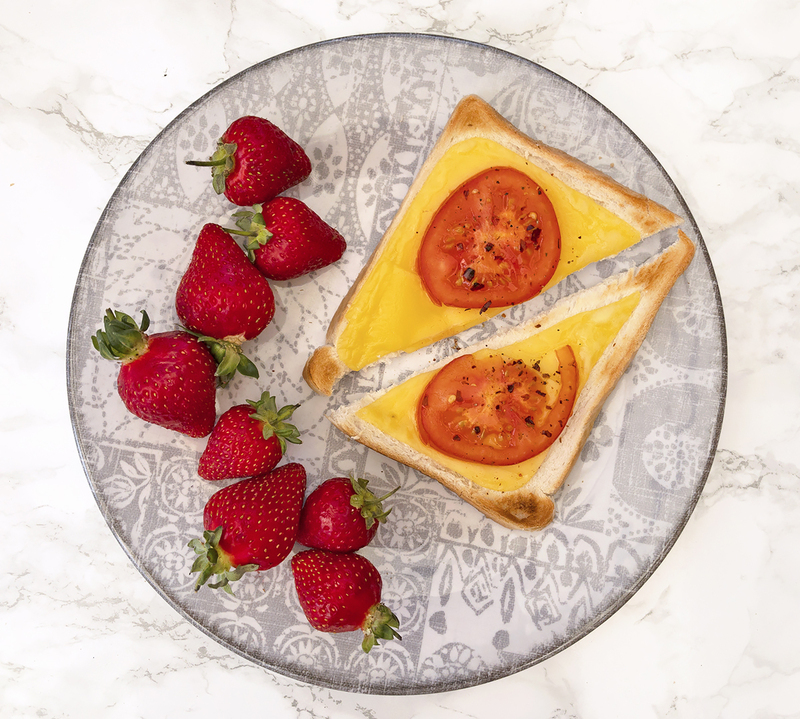 Cheese toasties were always my favourite thing to eat before I went vegan, and it wasn't easy to find an equally satisfying dairy-free replacement. Having said that, the Violife cheese slices come pretty close - they're probably my favourite vegan cheese alternative that I've found so far. They're super creamy and milky, and melt really nicely when grilled. I've topped the toastie with fresh tomato slices and some szechuan pepper, chilli and ginger salt. I've also had a few strawberries so that I could pretend that it was a healthier breakfast, ha! Since we're still in the summer season and fruits are not as expensive, I typically have a nice, big fruit salad for lunch. I am not much of a chef and like to keep things simple, so I typically just mix whatever fruit I have left at home. 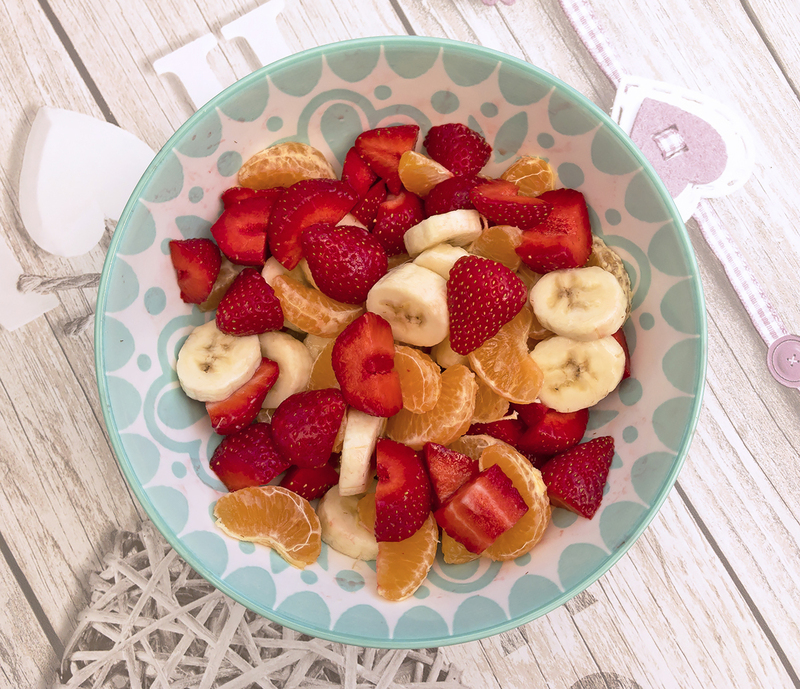 For this delicious salad, I used one large banana, a few handful of strawberries and mandarin oranges. Bananas are always a staple for me in any fruit meal - they're super healthy and much more filling than most fruits. It might not be the most adventurous, but it was definitely a really nice, light and satisfying meal! For a cheeky afternoon snack, I had this scrumptious almond vanilla dessert by Alpro. It was so yummy and convincingly milky, that I had to kept reminding myself that it's actually vegan! 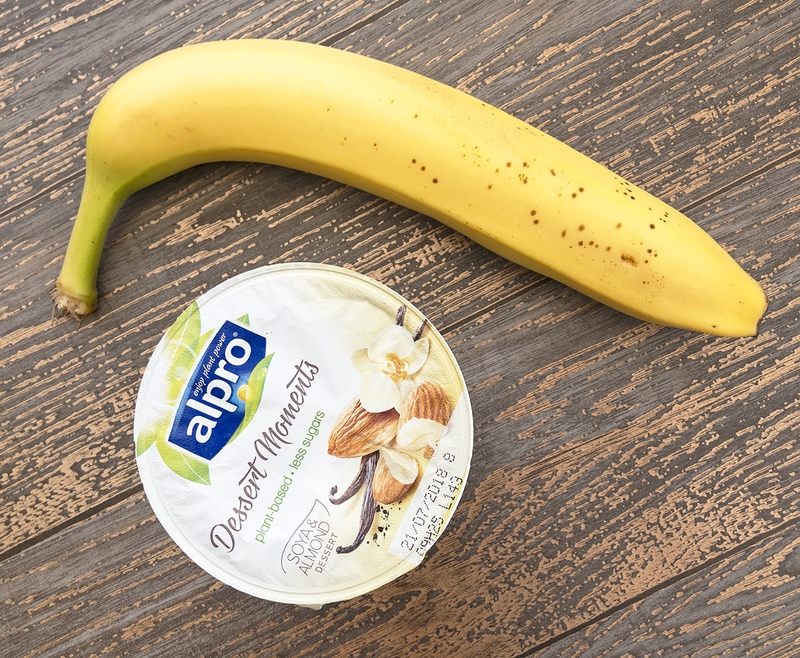 These pots are delicious and only 72 calories (I don't care about calories myself, but I think that the low calorie count would appeal to a lot of people), so I also had a banana for a 'healthy balance'! For dinner, I decided to prepare one of my favourite, easy vegan meals. 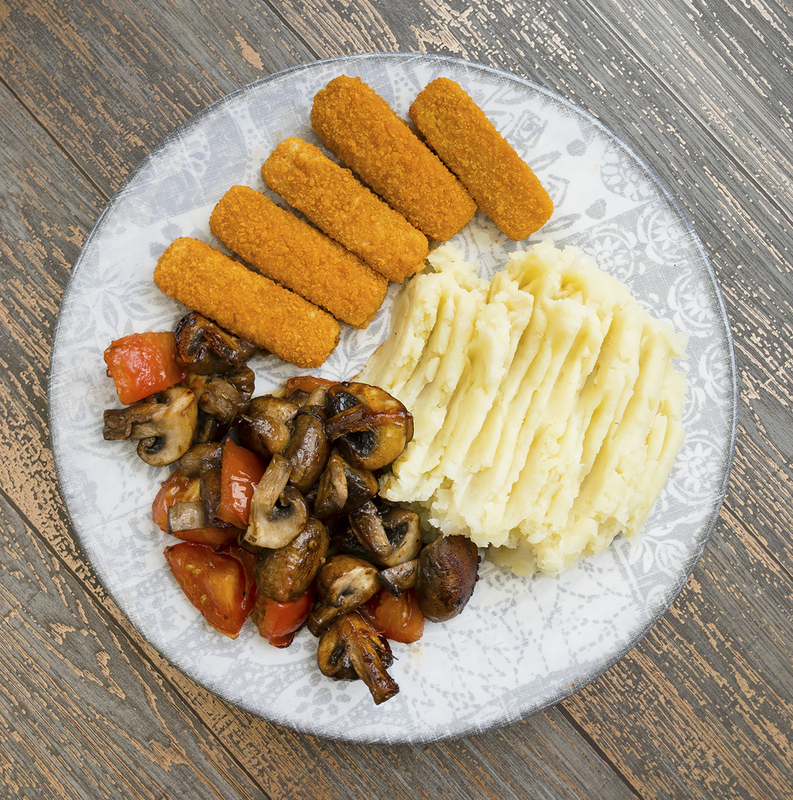 I had some mash potatoes, baked Quorn's fishless fingers (which honestly taste just as good as the real thing) and a simple mushroom stir fry. I am not a talented cook and like to keep my meal prep as easy as possible (I'm lazy! ), but this dinner was still very satisfying and delicious. For vegan mash potatoes, you can use soy milk and a nice-tasting, dairy-free margarine like Vitalite to make them extra creamy. For the veggie stir fry, I simply chopped up some organic mushrooms and tomatoes and fried them in one teaspoon of vegetable oil. I also added some thyme, lemon and bay salt for extra flavour! And that is my whole day of eating! I know that my food choices are probably not the most exciting, but I just wanted to show you how easy it is to eat vegan - you can even have grilled cheese! 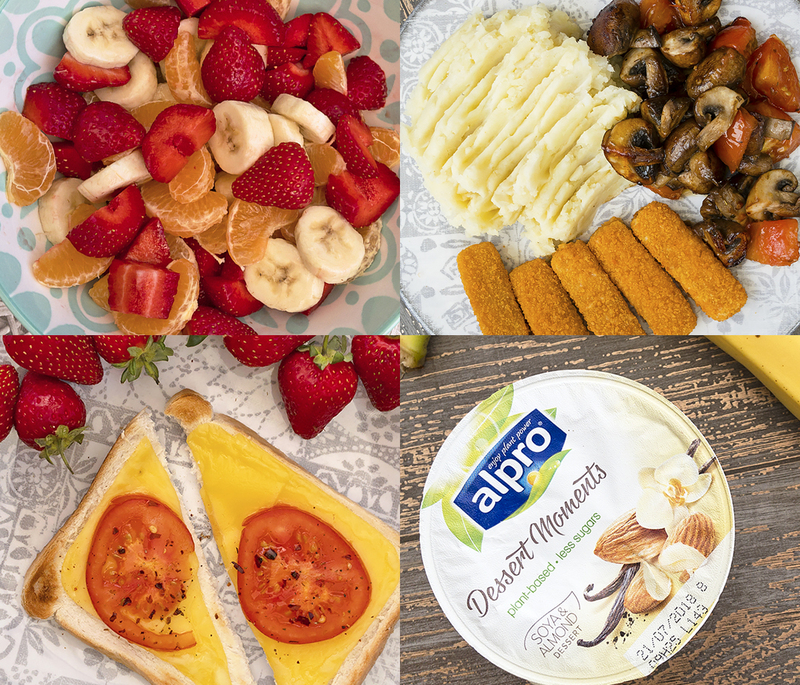 Thanks to the many dairy and meat-free alternatives, it's so effortless to swap out your favourites for an equally tasty, vegan option. Hope you enjoyed this post, and let me know if you'd like to see more content like this! Hello, my loves! Today, I am inviting you to go on a fully-vegan, fully-awesome shopping trip with me! I've had a lot of questions regarding my current vegan diet and dairy/meat alternatives, so I wanted to show you just how many amazing options there are. I find that a lot of supermarkets have really stepped up their game recently with regards to vegan foods, which makes me so, so happy! When I first tried going vegan over a year ago, I felt very restricted as there just weren't many options around. 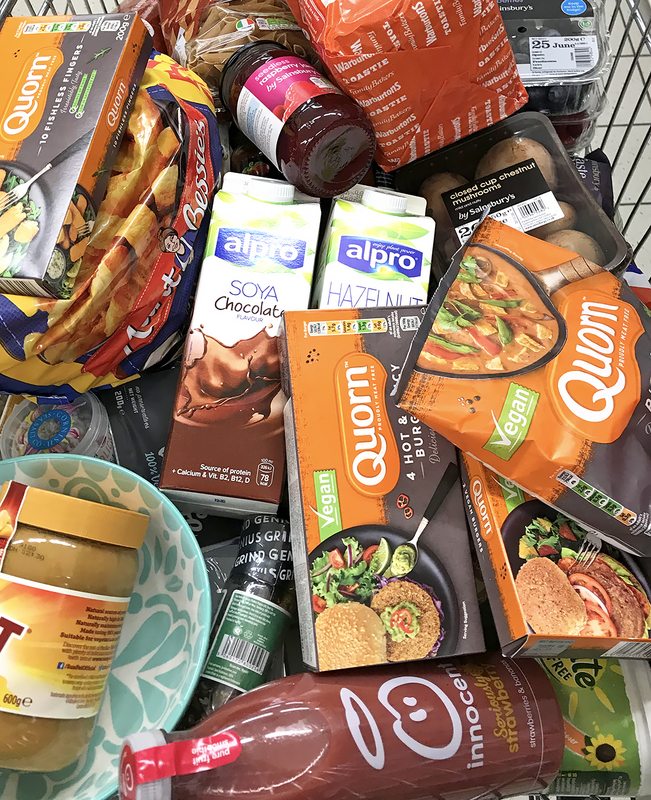 Now, with supermarket sections dedicated to meat and dairy-free alternatives (including things like cheese, yogurt, milk, pizza and even ice cream! ), I am finding it completely effortless to do my weekly shopping. And, I think that even if you would never consider going vegan, it might be fun for you to try out some of these alternatives - a lot of them are seriously delicious! Hope you enjoy this shopping trip with me! Hello, my loves! 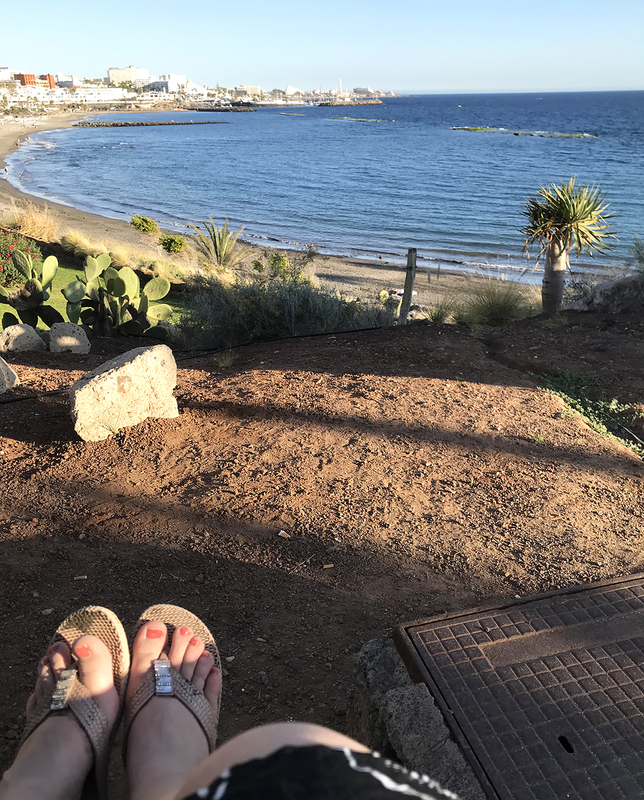 Today, I am very excited to finally talk to you about our nine-year anniversary trip to Tenerife. We had the most wonderful time, and I think that it might actually be our favourite holiday to date. It may seem a little strange, but whenever I am on holiday, it almost feels like living in an alternate reality. You are so far away from everything that makes up your everyday life - the grind, the routine, all the daily problems and challenges. You don't need to worry about going to work or any other everyday responsibilities - you are free to relax, explore and do whatever you like. Travelling is one of the few things in life that makes me feel truly happy and carefree, and I wish I could enjoy it more often. We always make a point to save up to be able to go on holiday once a year, and when we do, it is always super special. 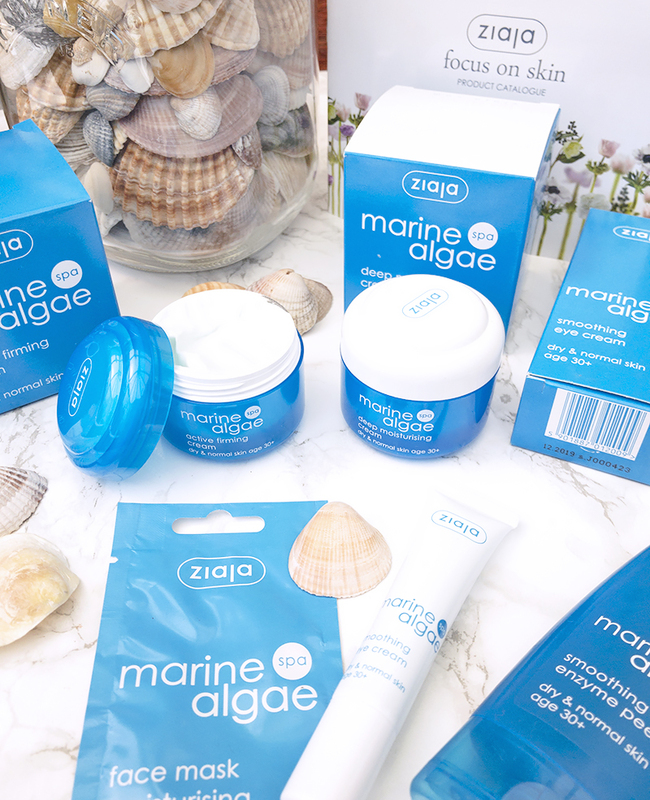 A Walk Down The Memory Lane With Ziaja's Marine Algae Skincare Range! Hello, my loves! Today, I am very excited to be bringing you a very special post in collaboration with Poland's biggest skincare brand - Ziaja. As cheesy as this may sound, I have always felt very sentimental about Ziaja - it was my beloved Nan's all-time favourite skincare brand. I grew up around their products, and I still have memories of getting into her skincare stash as a little girl, playing around pretending to run my own beauty shop (I told you it'd be cheesy!). 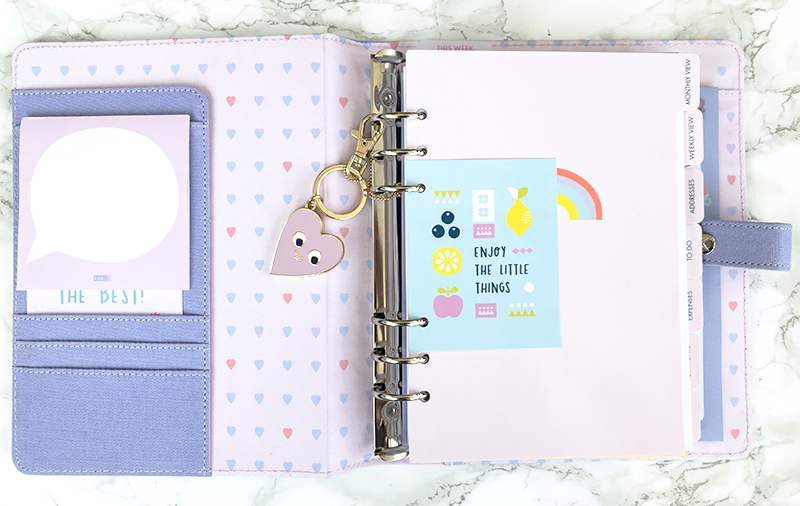 Living in the UK for the past eleven years, I have definitely missed their products, so I was over the moon to find out that they actually have an online UK shop! It was so excited to get my hands on these (very affordable!) goodies again, and it definitely brought back some memories, as well. Hope you enjoy today's review! My Top Money-Saving Tips For New Bloggers! Hello, loves! Today, I am very excited to share with you a few blog-related, money-saving tips. If you've been blogging for a while, you probably know just how expensive of a hobby it can be! 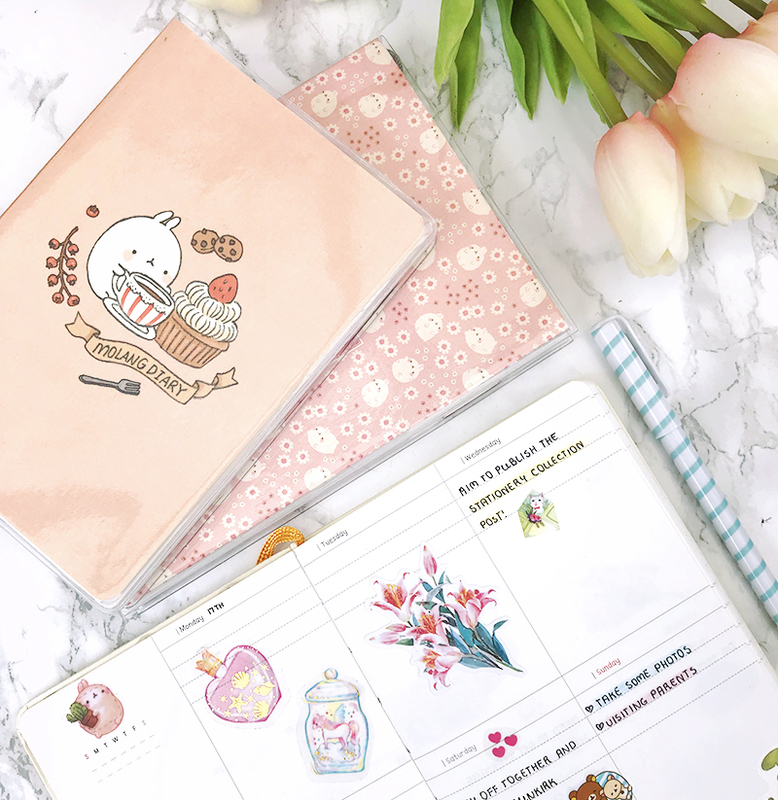 There are always things like a blog layout, a custom domain, a new blog camera, and of course all those endless products that we end up buying just to review them. It can be a bit of a financial trap, and today, I'd like to share with you a few tips (learned the hard way!) on how to save on any blog-related expenses. Hope you enjoy!